FedTech manufactures numerous parts for numerous industries, but some of the most common parts we provide for customers are custom gaskets. As you probably know, gaskets are typically used as a mechanical seal to fill the gap between two other parts. Whether an automotive gasket, or another type, gaskets are used to prevent discharge on parts that may leak under pressure. Custom gaskets are needed in a variety of industries as well, we have manufactured custom gaskets for all different sorts of applications. This includes marine, automotive, defense, aircraft, motorcycle, appliances, aerospace, engines, tooling, and others. Of course, we are likely able to complete your custom gasket project even if it's not included in any of these industries. Whether you are looking for custom gaskets, lock plate gaskets, head gaskets, filter gaskets, copper exhaust gaskets, engine cylinder head gaskets, parking light gaskets, intake exhaust manifold gaskets, old rotator gaskets, rubber silicone gaskets, or more; FedTech can help you create the exact custom gasket that you need. FedTech also offers value-added services including machining, finishing, forming, drilling, tapping, welding, assembly, and more. Ask a sales team member if you have any additional questions about what processes can be completed at FedTech. 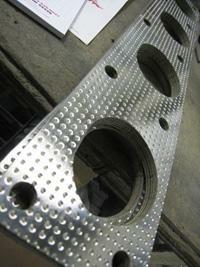 We are your one-stop source for custom manufacturing of gaskets. 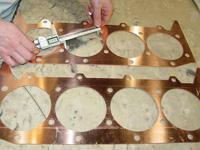 Typically, FedTech uses abrasive waterjet cutting to manufacture custom gaskets for consumers. This process works best with copper, brass, stainless, rubber, aluminum, and others. However for materials that may require an abrasive-free waterjet cut, we recommend water-only for materials such as cork, neoprene, felt, Teflon®, and other like-materials. Laser cutting is another option for sheet metal or other thin metals. The best way to make sure your project is completed to the highest level of satisfaction is to consult with a sales team member for exact specifications and other details that may help to smooth out the process of your project. Common materials used to fabricate custom gaskets include Armor 400 (AR 400), stainless steel, rubber, Buna-n, silicone, cork, neoprene, fiberglass, aluminum, Urethane, copper, brass, and many more. Obviously the goal of a gasket is to withstand high pressure loads without breaking or leaking, so the material chosen is often suited to accompany the application in which it will be used. Contact us today to learn more about our customer-centered approach to our custom manufacturing services, and get a quote for custom gaskets.